A buddy of mines wife put her foot down and told him to get it out of the living room...lol. I traded him one of my 8" Velos for WAF. This thing is sealed and puts out a lot of decent bass. I needed something bigger for nearly 4,000 cu/ft. Wat!? No love for old school Def Tech boom booms? I'm a fan. I had one years ago and it still lives at my aunt and uncle's house. I ran a PF1800 with my 1.2tl's for years. It's now doing duty with my khorns where it's actually needed lol. For a while I used 2 1800's with my Polks and that set up actually had me thinking structural damage to the building. I think those old Powerfields are great sounding subs. It really helps at lower volumes, which i listen to a lot. I love my sealed subs. I also for some reason feel that multiple smaller subs 12's or 15's seem to attack better than larger subs (like 18's and 21's). Or at least the consumer subs I've heard. 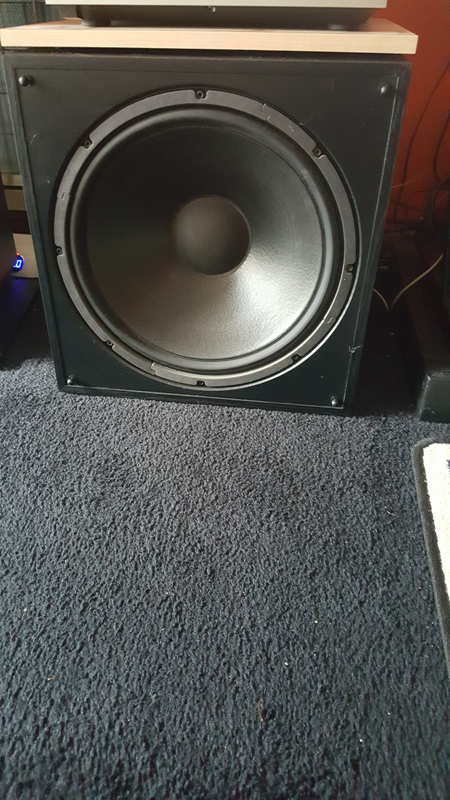 I've heard and felt many good pro audio subs in the 21" range that attack quite nicely but I feel thats more because of the way they are built v consumer DIY drivers. Perspective! This 15" looks huge as ive been running dual 8" for years. hehehehehe...... well depends on how the 8's are setup and how deep you really need/want. A pair of 8's in the right box for music only can do quite a bit. Ask them to hit 20hz and lower.... not so much.. I'm shocked on well the MicroPro 2k I have does, but its also got a passive so its like a ported 8". My room is also a bit small. The velos did ok. Had room correction. I can feel the bass more with tjis one. Thats a good thing! We all know I like the bass.